With extra-long pile fibers to trap warmth, the Re-Tool will keep you cozy on your two-day trek across Wisconsin’s Oak Island and still not look out of place when you return to Bayfield for pizza and beer. 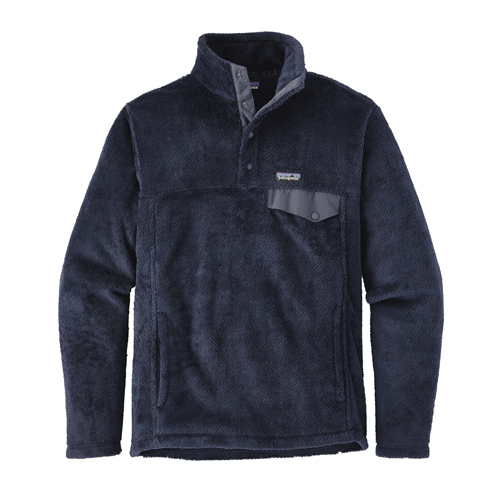 Soft, slightly fuzzy and irresistibly livable, our Re-Tool Snap-T® Pullover is made of Polartec® Thermal Pro® fleece (51% recycled) with a forest of long fibers to retain warmth and insulate whether worn over a T-shirt or layered under a shell. Comfortable enough to pull double duty as a pillow or blanket when you’re stranded on an airport floor, it has a stand-up collar made from two layers of fleece for wind protection, nylon-reinforced front placket with snaps for quick venting, a roomy kangaroo-style handwarmer pocket, one chest pocket and flat-seam construction throughout to reduce bulk and eliminate seam chafing. Hip length. Fair Trade Certified™ for sewing, which means the people who made it earned a premium for their labor.